A sea trial of one of the yachts of this Chiuduno (Italy) based yard must include an examination of the high construction standards. This is, in fact, the reason of the outstanding comfort achieved on board (stability, noise insulation, seakeepness etc...), together with the exciting performances. The Uniesse 52, the yard's flagship, is perfectly in line with this philosophy of reliability and building accuracy, emphasized by the excellent performances achieved with relatively small engines. The engine room, in particular, represent the perfect example: it is clean an well dimensioned, ensuring safety and efficiency. Flying-bridge particulars: Plexiglas windshield, adjustable pilot and co-pilot seat, dashboard with steering wheel, throttles, engine monitoring instruments and gauges, compass, log and echo sounder repeaters, fiberglass radar arch, settees and sunbathing area, wet bar with refrigerator and sink. 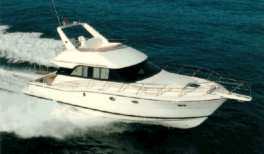 Lay-out and main features: three cabins with two bathrooms (bow owner cabin with two wardrobes and three drawers; two twin beds guest cabins with wardrobe and lockers; two bathrooms with separated shower, fully hidden wc and bidet, sink, furniture and lockers), split-level saloon with sofa and U shaped dinner dinette and furniture, steering station with seats, separated galley with access to the crew cabin with bed, electric marine wc, sink, wardrobe and lockers. Teak furniture and cabins sole, leather, Lorica and Alcantara and upholstery. Steering station: The inside steering station include: compass, hydraulic throttles, hydraulic steering, log, depth sounder, VHF, trim tabs control, engines monitoring instruments and gauges. Galley: placed to the port side with access from the saloon wit hanging lockers, working top, two stainless steel sinks, 4 burners stove, dishwasher, 140 liters refrigerator, storage space, oven. Standard equipment: horn, stereo system with two loudspeakers in the saloon and in the flying bridge, 8 kW gen-set, boiler, air conditioning in all cabins, double station trim tabs, GPS / chart plotter, Flying bridge VHF, autopilot, engine room fire-fighting plant. Seakeeping: The yacht perform on the water as anyone should expect from a Uniesse boat. The Uniesse 52 is extremely reliable in all conditions, while the ride is surely elegant. Very dry topsides. Excellent low planning speed. Rudder and trim tabs response: very accurate and precise. Visibility: excellent from the flying bridge, good from the inside steering station. Deck: easy to walk and with excellent fittings. Flying-bridge: accurate lay-out with a large sunbathing area. Interiors: excellent and elegant joiner work. 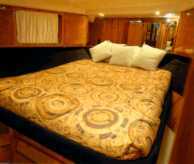 The practical design ensure privacy and habitability throughout the boat. 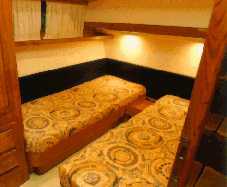 Passengers comfort: excellent both for seakeepness and noise level. Chart table: spacious and practical. Bathrooms: spacious and completely equipped. Engine room space: well organized and practical. One of the best spot of the yacht with a safe entrance from the cockpit. The saloon sole is removable for engines maintenance. Electrical plant: extremely technological and safe. The plant has to be closely inspected, because it is a masterpiece. we would appreciate the standard teak deck.